In the late 1960's we arrived in Boston as two wild eyed kids in the big city. It took us a while to meet and that was the beginning of our exploration of the world. But we have returned to Boston several times to enjoy the sights, sounds, and great food of the city. Christmas 1999 found us in the city for our 30th anniversary, which was a whirwind of excitement with old friends and reliving old memories, even though it was freezing cold. And late May 2005 found us once again back in the city, which is where these pictures come from. There is so much to see and do in Boston that it should be a required stop for everyone at least once in their life. 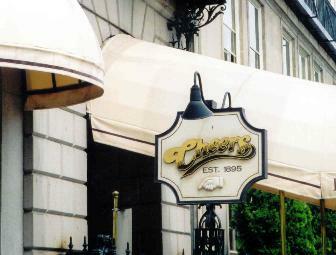 Cheers, a great place to eat and one "where everyone knows your name" is a nice break in the middle of a day of sightseeing. 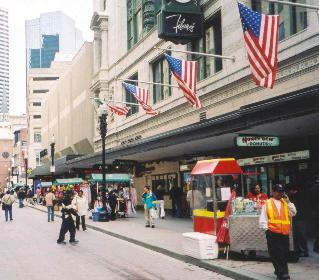 Filene's for shopping and street venders for a snack make downtown fun. 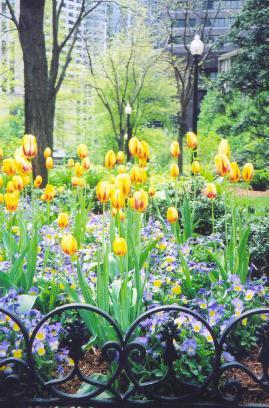 The colors of Boston in the Spring add a relaxing beauty to the city. 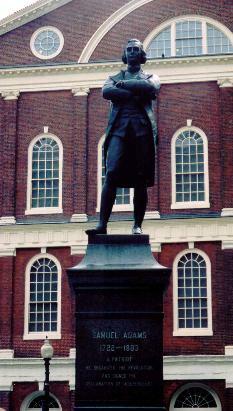 Statue of Samuel Adams in front of Faneuil Hall, built in 1742 as a market place and meeting hall. The inscription reads "1722 - 1803 A Patriot He organized the revolution and signed the Declaration of Independence." 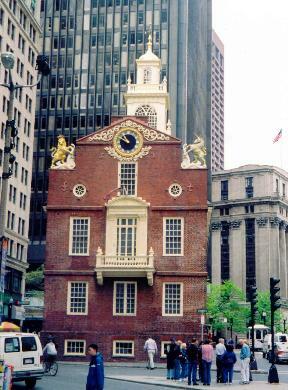 The Old State House built in 1737 was once the tallest building in town. 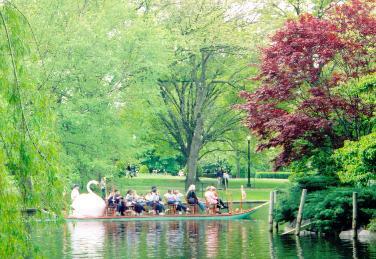 The Swan Boats, part of the life of the city, are adjacent to the Boston Common, which is the oldest public park in America. On June 14th 1969, from the same park bench where I took this picture, Rosalie said yes to my proposal of marriage.